Whether you're in a penalty box or on the bench in an opposing arena you're going to get plenty of stick from fans throughout the game. Sometimes it's funny trash talk, other times it's stuff that crosses the line, but athletes are trained to tune it out and laugh it off. But what about when they're dressed as Roman gladiators? 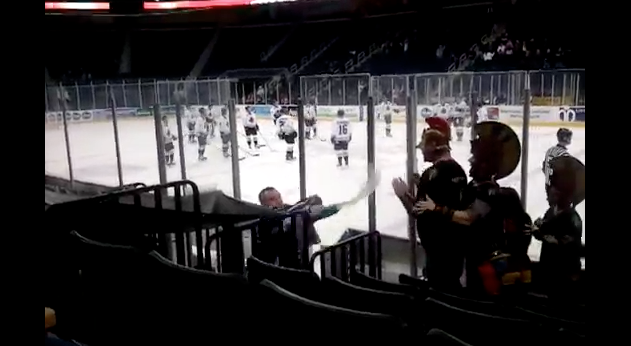 The game was last Thursday and this video was posted on YouTube the very next day, but it took until Tuesday for the ECHL to finally get its hands on it and fine Curry an undisclosed amount for his postgame behavior. You might remember New York Rangers head coach John Tortorella getting suspended during the 2009 Stanley Cup Playoffs for a water bottle incident with a fan, but Duncan Keith of the Chicago Blackhawks getting off with no punishment for squirting a fan in Nashville. The difference? Attitude. So Mr. Curry, for future reference: Don't squirt angry.